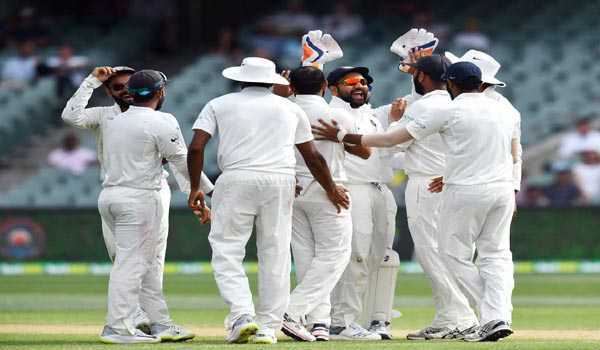 Adelaide: After posting a challenging target of 323 runs, India reduced Australia to 104/4 on the fourth day of first Test at Adelaide Oval on Sunday. At stumps, Shaun Marsh (31) and Travis Head (11) were at the crease, while Australia still need 219 runs. Chasing a mammoth total of 323 runs, the hosts got off to a bad start as they lost their three early wickets for 60 runs. Aaron Finch was the first man to go for 11, when he was caught off Ravichandran Ashwin. He chose not to review the decision. However, replay suggested the third umpire would have overturned the decision and Finch could have remained at the crease. Finch had earlier successfully reviewed an LBW decision on the second ball of the innings. Marcus Harris was then caught behind, trying to cut a wider ball. Then, Ushman Khawaja was caught by Rohit Sharma at cover reason off Ashwin. He came out of his crease hoisted the ball, eyeing towards leg-side, Sharma kept the eyes on the ball and took a brilliant catch, reducing Australia to 60/3. Peter Handscomb was dismissed by Mohammed Shami for 14 runs. He tried a pull short and was caught by Pujara at short mid-wicket. Ravichandran Ashwin and Mohammed Shami bagged two wickets each. Since 1902, no team has managed to chase down more than 300 runs target in the fourth innings at Adelaide Oval. Earlier in the morning, India resumed their innings at 151/3. The visitors added 109 runs to the first session. Rahane-Pujara's partnership was broken by some exceptional bowling from Nathan Lyon, who picked the big wicket of India s first innings centurion Pujara, departing to a standing ovation from the Adelaide crowd for his 71. Rohit Sharma was dismissed for just 1 by Nathan Lyon, who was the pick of the bowlers with six wickets. Rahane, who scored his 16th Test fifty, was joined by wicketkeeper Rishabh Pant, who was more aggressor. He hit three fours and one six off Lyon. Pant departed after a nice little cameo scoring a 16-ball 28. He was dismissed by Lyon. The visitors looked in hurry after the lunch. Australia snapped three wickets in the space of seven balls to clip the Indian innings, looking to extend their lead to around 350. Lyon dismissed Rahane, who tried reverse sweep only to find Mitchell Starc at backward point for 71 runs. On the very next ball, Mohammed Shami was departed for duck. Starc removed Ishant Sharma in the form of last wicket, wrapping Indian innings for 307 runs. Nathan Lyon bagged 6 wickets in his 42 overs, considering 122 runs. While Starc, who was off colour, picked three wickets going for 40 runs.